Niche: Helping HVAC get leads and customers. 1. Where Tyler was before joining Consulting Accelerator. 2. How commuting and craving freedom played pivotal roles in helping Tyler pick and narrow down his niche. 3. The problems Tyler identified and solved in the HVAC niche from both the business and homeowners perspective. 4. 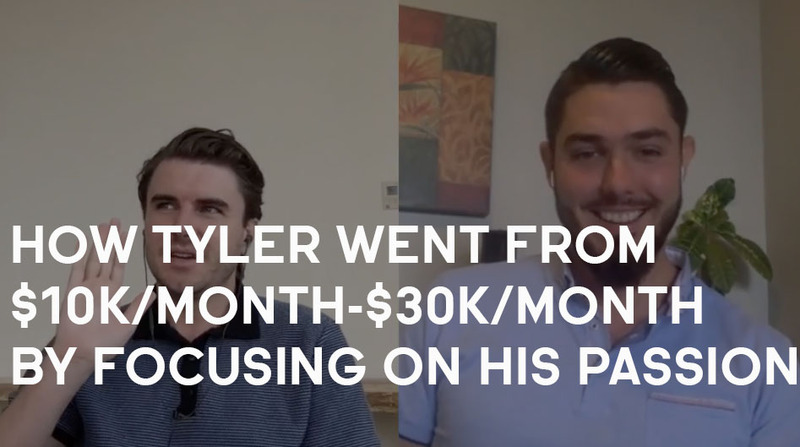 Tyler’s breakdown on how he targeted a specific group of homeowners and packaged his offer to his clients. 5. The ten-year plan Tyler hopes to achieve for his business. 6. The most transformative part of Consulting Accelerator for Tyler. Do the mindset work and believe in yourself! Sam Ovens: [00:01:00]	Hey everyone. Sam Ovens here, and today I have Tyler MacWhirter on with us, and Tyler's got an awesome story. He joined Consulting Accelerator in December last year. What's that now? About eight months ago, and back then when he joined, he had a Shopify store. He was doing the e-comm thing, and he was making in between three to 10K a month, and he wasn't really that passionate or in love with what he was doing, and he wanted to do something that he was more passionate about. So, he enrolled in Accelerator and he was able to pick his niche, which is helping HVAC companies get leads in customers. Since he started focusing on that niche which he's passionate about, he's been able to grow his business to $30,000 per month. Looking forward to digging into this story and seeing what makes you love HVAC businesses so much. Tyler M.:	I look forward to it. Sam Ovens:	Let's start with December last year. What's going on? Tyler M.:	December last year I was selling heating and air conditioning like I had been doing for about nine years. I also had my Shopify store. Sam Ovens:	What was your Shopify store doing? [00:01:30] Tyler M.:	Like in revenue? Sam Ovens:	What were you selling? Tyler M.:	I was selling essential oils. Sam Ovens:	Are you into oils? Tyler M.:	I'm not into them, but they sold pretty good, so I was enjoying it. Sam Ovens:	So, it was a money thing instead of a passion thing? Tyler M.: [00:02:00]	That's right. I was always trying to get out of heating and air because I had been in over 1,000 homes, and I was just getting tired of that sales presentation for very small commissions, but it's what paid the bills for those nine years. Then I started the Shopify store in about late 2016, but I was still selling the HVAC, and then it just got to a time where I was like, "Okay. I'm going to get into Consulting Accelerator because if I learn the systems, I know I'm going to be able to implement them to get results. I just need to know what to do in order to be a consultant." [00:02:30]	I took the program, and yeah. I just kept following the steps day to day, looking at my war map, doing what was on my war map, and yeah. Now we're here, but I wasn't very happy with where I was at in December, but now I feel good about where I'm at. I like serving the niche that I'm serving because I can get them very good results compared to a lot of other businesses that do the same thing. So, it's a good relationship because I'm their go-to guy. [00:03:00] Sam Ovens:	Let's talk about why you weren't very happy in December because you're making money selling essential oils. Tyler M.: [00:03:30]	Yeah. I was making pretty good money with my HVAC sales and essential oils. I was making more money than I had ever made, but I wasn't happy. I was working like 10 hours a day selling HVAC. I'd be on the road working on my essential oils store. I'd have a break, maybe a two-hour break in between the day, in between appointments. I'd go to Starbucks and work on my store, and it was a hustle, a grind, and I hated it because I was on the road all day for nine to 10 hours every day selling HVAC, at the same time working on my store. I was run down. I just couldn't do it anymore. I didn't like what I was doing, and yeah. That's where I was. Sam Ovens:	What was it that you didn't like? Was it the traveling around? [00:04:00] Tyler M.: [00:04:30]	Yeah. It was mostly the traveling around, having to. I didn't mind going on the sales appointments. I enjoyed that part of it, but it was the traveling around. I'd be sent to maybe eight homes in a day, and they'd all be different. I'd have to drive about an hour to two hours out sometimes to start the appointments. Sometimes they weren't homes. Sometimes they were, but I liked the job. I just didn't like the traveling. I was sick of the traveling. It was three to four hours of travel every day, at least, just for the commute there to the appointments and the commute back. Sam Ovens:	Yeah. I get that. Commuting is a waste of life, really. Tyler M.: [00:05:00]	Yeah. I like that. For nine years I did that, and then I looked back and I was like, "Wow. Look at those hours that I had lost." I listened to a lot of audio books and stuff in those commutes. I learned a lot. I think that was good, but it got to a point where I needed to make better use of my time and add more value into the marketplace instead of just selling HVAC or selling essential oils. Now I think I've found that, a good niche and a good fit. Sam Ovens: [00:05:30]	It's funny. I used to do a delivery job when I was at university in New Zealand. I would deliver medicine to old folks homes, and I would drive for three hours a day. It was job, and it was ... I actually kind of liked it back then because it meant I could think about whatever I wanted. I had my mind free, so I could listen to books, or I could think about all sorts of different stuff, and no one was supervising me because I was just out driving around. I thought that was actually pretty good. It allowed me to think about lots of stuff compared to, say, being in an office and having someone watching over you all the time. [00:06:00] Tyler M.:	Yeah. 100%. That's why I liked that job because I was free. I was able to think. I was able to listen to audio books, personal development, and then think of my own stuff. I liked the driving part at times because I could think and I was free on the road, and then I would go sell, and I thought that was a good skill to have, too. I was like, "I'm in a good spot right now." But really, I was just comfortable and I needed to get out of my comfort zone. [00:06:30] Sam Ovens:	Got it. Yeah. The freedom of thinking allowed you to think enough to think that you don't want to do this. Tyler M.:	Yeah. It allowed me to- Sam Ovens:	That's what happened to me, too. Tyler M.:	Yeah. It allowed me to think about my steps I wanted to take, but until I actually took those steps, I couldn't think any further beyond that really. I could a little bit, but I really need to take action, and do the stuff, and commit to actually getting away from it 100%. [00:07:00] Sam Ovens:	Got it, and so, how did you come ... You're in December selling HVAC and essential oils. That's a good combination. It's a funny one, and then you're not happy because of the commute and all of this, and now how did you come across Consulting Accelerator? [00:07:30] Tyler M.:	I had taken Tai Lopez's social media program and one of his guys, Joe Soto, who did some presenting in that program, he mentioned that you were his mentor. He said, "Yeah. I have Sam Ovens as my mentor." He had like 300 restaurants paying him every month, and I had seen one of your Facebook ads a little bit before that, and I was debating on buying yours or Tai's program. [00:08:00]	At the time I went with Tai's program, and then when I got into his program and I heard Joe Soto say that you were his mentor, I was like, "I got to get Sam's program because this is what's going to teach me on the phone and how to acquire the customers. "Yeah. That's when it happened. It was right before I got Tai Lopez's program, and then I heard Joe Soto mention you, and then I was like, "Well, I got to do it. It's just a matter of time because it's the next step." Sam Ovens:	It's funny, huh? The guy teaching in Tai's program is Joe and I taught Joe. Tyler M.:	Yeah. [00:08:30] Sam Ovens:	But you probably chose Tai's ... Why did you choose Tai's? That's interesting. Tyler M.:	I chose Tai's because I didn't think I had the skills to do the social media at the time for the businesses because this was before I started running my ... Yeah, before I started running my Facebook ads for my essential oils, like right before it. I didn't really have the skills yet to run Facebook ads. I'd run other digital marketing campaigns like solo ads and stuff like that, but I'd never run Facebook ads. [00:09:00]	I wanted to get some knowledge first and just see what I could learn because it was like 1,000 bucks. I figured let's do it. I'll go through the program, and it was worth it. It was well worth it, and then, yeah. I'm glad I bought them both, though, but I just decided to go with his first because what I thought I would learn about social media, and then it ended up I learned more just on my own implementing Facebook ads with my store. [00:09:30] Sam Ovens:	Got it. Yeah. That partnership I had with Tai was good because, one thing's for sure, he's more famous than I am. He can get way more attention, and then I was free to just focus on the work, you know what I mean? Tyler M.:	Yeah. Sam Ovens:	And it worked quite well. Then you joined Accelerator, and what was it that made you want to join Accelerator when you were looking at it? [00:10:00] Tyler M.:	Because I knew I wanted to help businesses generate more leads. I didn't really know which niche I wanted. I wasn't even thinking about heating and air conditioning because I had run so many sales calls and I was just like, "I got to get away from this industry." But I wanted to join Accelerator because I knew that's where I would learn how to acquire customers, and that's the most important thing I feel like is acquiring the customer, because if you don't acquire the customer, you can't grow the business. [00:10:30]	If you don't know how to do it predictably, you can't grow the business. I didn't learn much about that in Tai's program. I only went through a little bit of Tai's program, and then I just continued selling, and was just trying to save up my money to get your program, but yeah. Then I realized your program was about acquiring customers. That's what made me buy your program. Sam Ovens:	Got it. Tyler M.:	Because I knew if I didn't know how to do that, I could be the best social media guy in the world, but if I didn't know to get customers, then I'd be lost. [00:11:00] Sam Ovens:	Got it, and then what happened when you joined? Tyler M.: [00:11:30]	When I joined, I dug right into the content. It was way more than I expected. It was so much content, but it's all great content. There's still some modules near the end that I haven't even gone through because I've just been taking action, but when I joined I got to the part where we start taking action, we start reaching out to our niche, and I had originally selected e-commerce stores. I'm going to help the e-commerce business owners grow their Shopify stores or whatever platform they're using. [00:12:00]	I made some sales. I had a bunch of strategy calls coming in, but I wasn't talking to the people I wanted to talk to. I wasn't serving the client I wanted to serve. I follow Dan Kennedy a lot and he talks about the high-end customers. You want to be the business owner who can have the high-end customers that can increase their profits and grow their business faster. [00:12:30]	I knew HVAC. They would pay me every month if I could get them results, so I'd be able to make more money and I'd also be able to create more value like that. Then in May, I decided to start helping HVAC business owners, and it's been really good. I'm glad I made the change because they get good results from when I help them, and I also prosper in turn as well. Sam Ovens:	So, let's talk about that because the first part is really picking your niche, right? I tell people to choose something that they're interested in, and you chose HVAC. What- Tyler M.:	First I chose e-commerce. Sam Ovens:	Okay. [00:13:00] Tyler M.:	Then I chose HVAC, yes. Sam Ovens:	So you chose e-commerce, and why did that decision occur? Tyler M.:	Because I was doing very well with my Shopify store, so I figured I could add a lot of value by helping others. Sam Ovens:	You were doing well with your Shopify store financially, so you thought you could help other people do well with Shopify stores financially? Tyler M.:	That's right. [00:13:30] Sam Ovens:	But we discounted the emotional side of it? Tyler M.:	That's right. Emotionally, I wasn't in it, and I wasn't talking to the ideal client that I wanted to talk to. Sam Ovens:	Got it, and then- Tyler M.:	That was the biggest- Sam Ovens:	... how did you realize that that was a mistake, because I see how the logic lines up to make the decision, and then you start on this path, and when did you know that you needed to change? [00:14:00] Tyler M.:	I had a bunch of strategy session calls come in. I was doing a bunch of calls, and my program was $3,000 that I was offering. I made some sales, but then I had started reading one of Dan Kennedy's books again about selling to the affluent. I had read it before, but I picked it up and started reading it again, and it just got me thinking that I really need to think about the customer that I'm focusing on right now because I choose them. [00:14:30]	Then I just decided that day. I was like, "I've got to focus on the HVAC clients because they're a higher end customer and I can provide more value to them." I knew originally that's what I wanted to do, and then after reading that again and just understanding it, letting it sink in, I knew 100% I had to make that switch, and that's what I wanted to do. So, I just went 100% and did it. [00:15:00] Sam Ovens:	Got it, and then, yeah. Why HVAC? What makes you passionate about HVAC? Tyler M.: [00:15:30]	Well, I really understand the business. I was trained very well through my whole sales career selling HVAC. The average ticket is very high. One good salesperson will sell about a million dollars a year in revenue. I knew that if I filled that gap, instead of selling the jobs, if I fill the gap of bringing in the leads, which was always lacking those nine years I sold HVAC, then I'd be very valuable to the company. I enjoy the business. It's a great business. [00:16:00]	It's a great service they provide, providing heating and cooling, and me on the business side of it helping the business owners with the leads, they would pay me very nicely, and in turn they would get very good results from me generating good results for them. I just felt like it was a win/win all around. The business model is great. I really like the business model because it's very high revenues. If I can get them, say, 30 leads in a month, they could do over 100,000 in a month from that, and it costs them maybe 5,000 to $8,000. It's very minimal to them. It's worth it to pay me that kind of money with their ad spend to generate six figures a month. [00:16:30] Sam Ovens:	Got it, but that's logically. How [inaudible 00:16:30], but things we're passionate about aren't always logical, you know? Tyler M.: [00:17:00]	Yeah. Emotionally, I always had good connections to my sales managers, the owners of the companies that I sold for. I preferred interacting with them than the salespeople. I didn't have anything against salespeople. I'd just rather talk to the business owner when I was at the office every once in a while, maybe a few times a week, and I understood where they were coming from. They wanted to grow their business, but they didn't know how to generate more leads. Whoever they used, they weren't happy with the results. I felt empathy for them. Now, being in a position where I can help them, I really like it. Emotionally, it's a good fit as well. Sam Ovens:	I guess you, because you used to do sales for these HVAC things, how did you get fed the leads to go and sell? [00:17:30] Tyler M.:	It was usually direct mail, radio ads, TV ads, and then later on in my selling HVAC it was telemarketed leads. There'd be a call center that would set up the lead for me to go out, but it was different marketing channels. Some online as well. Sam Ovens:	And the business would take care of that, and they would run that, and then you would get these leads and go and see them? Tyler M.:	Yeah, and it would be my job to go and sell 40-60% of every one I sell. [00:18:00] Sam Ovens:	Then did you ever have a curiosity about, "Hey. I wonder how we generate these things." Like, "I'm going to see these people all the time. Some of them seem good. Some of them aren't even at their house. Wonder how this works." Tyler M.: [00:18:30]	Yeah. I always had a curiosity because marketing was always my first passion. When I was 18, I'd gone into marketing, and that's what I've loved ever since more than sales. Marketing has been my thing. I had always known that I could get them results. I was just focused on making my sales and trying to build my online stores, because during those nine years I was always trying to build an online empire. It just didn't work the way I wanted it to, but yeah. I knew I could get them the results, but I wasn't at a point then where I wanted to do it. I guess, yeah. I just felt comfortable running my leads and doing my own marketing stuff on the side at the time. [00:19:00] Sam Ovens:	Got it, and then let's define the problem for these HVAC businesses. Tyler M.: [00:19:30]	Their problem is they want to grow their business. They know they need to generate more sales. The only way to generate more sales is to have more leads, and that's where the problem comes in. They can hire digital marketing companies, but they don't usually get the results that they say they're going to get. They're using radio mailers, direct mail, everything like that, but they can't scale it up. [00:20:00]	So, they're at this point where they want to grow their business, and they're stuck, and everyone who has tried to help them, like digital marketing companies, haven't produced the results. That's where I come in, and I understand the business and I understand the homeowner. I understand what makes them tick. So when I build the ads, they're good ads that make them take action, and they work because I understand what the homeowner wants to hear because I've sold to them thousands of times. Sam Ovens: [00:20:30]	Yeah. You're a full stack in that sense because you are talking to the homeowners for years visiting them. You also have an empathy for the salespeople because you've been one, and you've done that, and driven around all over the place. Also, you understand the business side and the marketing side, and you've just kind of pulled all of those things together whereas the business owner doesn't so much understand the end user, or the salesperson, or the marketing. The marketing person doesn't understand, really, the business person, or the salesperson, or the ... You know what I mean? Tyler M.:	Exactly. Sam Ovens:	You end up with all of these people that only understand their piece, but not the others, and you pulled together a full understanding of it. Tyler M.: [00:21:00]	That's right. That's why I felt like HVAC would be a good fit as long as I could get them the results, because when I got my first client I had never run HVAC leads before. After a few weeks in, I had a system down, and now I can go to that system every day. It just works every day now, but I knew if I could get them results, then I would be very valuable to them. [00:21:30] Sam Ovens: [00:22:00]	I've seen this pattern emerge a lot. For people listening, there's another interview I did with Oguz Koni, O-G-U-Z K-O-N-I. I think that's it, and he helps merchant processing businesses that install these merchant processing credit card machines, and he used to sell those. He was used to selling those as salesperson. He'd get fed the leads, and he always remembers he had a similar sort of curiosity about that, and he taught himself marketing on the side. Then now he's pulled it all together, and so now he helps these businesses with the marketing and the sales side, and he has an understanding for the customer too. Yeah. It's a very- Tyler M.:	That's great. Sam Ovens: [00:22:30]	It's a very common pattern that emerges. A lot of salespeople from companies end up starting their own thing because they're frustrated that the company won't change the marketing or the product. Their job as a salesperson, you're heavily reliant on the product. A great salesperson will want to sell a great product, and they'll also want good marketing that's going to support them, and if they don't get that, then they'll go and make it themselves. Tyler M.:	That's right. [00:23:00] Sam Ovens:	Let's talk about the HVAC problem. We understand the problem from the business's perspective. They've got salespeople. They can get more of them, but the bottleneck is the leads, and they've probably got installers and they can get more of them, but they need to sell more, and to do that they need more leads. That's the bottleneck, right? Tyler M.:	That's right. Sam Ovens:	Now, let's talk about the problem from the homeowner's perspective. They're in their house. What has to occur for them to either think about or want HVAC? [00:23:30] Tyler M.: [00:24:00]	For them to think about or want HVAC, they have to either have a problem, maybe their house isn't cooling the way it should or it's not heating the way it should, or they see an ad like something that I would put on Facebook that would [inaudible 00:23:44] in their mind like, "We need to get that taken care of soon," or, "I know it's getting old, my system, my HVAC system. Maybe I'll call this company." Their thing is they either have a problem right now, or they want to be proactive with a problem that could occur. Sam Ovens:	What is the problem? Tyler M.: [00:24:30]	The problem is their equipment isn't working the way it should. Maybe they're not getting an even temperature in the home. It's not as comfortable as they would like. Maybe their bills are too high. There's a few different problems. Those are the main ones. They're not comfortable. It's not heating or cooling right or their electrical, and hydro bills, and gas bills, they're too high and it's most likely because of their heating and air conditioning system. Sam Ovens:	It's not so much that it's broken completely? Tyler M.: [00:25:00]	Not usually, no. Usually it's just it's getting old, and they know they've got to do it soon, and they don't want to do it because they know it's a lot of money. So, the way I position my ads is where they can do it now, and they don't got to put out all that money right now. Yeah. They know they need to do it, but they don't want to because it's an expensive purchase. Sam Ovens: [00:25:30]	Got it, and then your ads, you ... Wait. We'll stay in the perspective of them. They're living in their house and their temperature in the house is fluctuating, or they know that their machine is getting old, or they see their energy bills that are really high. Any one of these things are all happening, and then they're not quite forced to the point of acting on it, but it's there. Then you're putting some stimulus in front of them that it triggers them to do something? Tyler M.: [00:26:00]	Exactly. They know they've got a problem, or they may not even know. They just might feel it a bit and be like, "Oh, yeah. It's the system, my air conditioning system, but it's fine. It'll get by." Then when they see the ad, it brings that up again like, "Oh. I could do it, and they've got this deal." Something like that. Sam Ovens:	Why should someone do anything about it if it isn't broken? Tyler M.: [00:26:30]	It's usually best to do it when it's not broken because even though it's not broken, if you take a look at the gas bills, the electrical bills, the hydro bill ... Well, not the hydro. The gas and the electrical, they're 30% higher than they need to be. So when you do the math, if they keep the system running for the next five years instead of just buying one right now, they would spend in electrical bills half of a new system again. It makes sense to do it before rather than when it needs to be done. It's better to be proactive about those things. [00:27:00] Sam Ovens:	Got it, and then the way the businesses currently do, we'll switch back to the perspective of the HVAC business. They're just running radio ads and traditional old-school media like radio, or direct mailers, postcards, things like that? Tyler M.: [00:27:30]	Yeah. They do Google PPC and SEO as well, but I've found that the issue with those when it comes to HVAC, you can only get the piece of the market who knows they need to do it now, and there's- Sam Ovens:	And who are searching. Tyler M.:	And who's searching for it. You can't get the other- Sam Ovens:	[crosstalk 00:27:37]. Tyler M.:	Yeah. You can't get the other piece of the market, which is a much bigger market, who is on the fence, but they haven't run into the right stimulus yet. Sam Ovens:	Yeah. That's what Facebook really changed the game with. You used to have to just create businesses that solved needs people were actively searching for. Tyler M.:	Yeah. [00:28:00] Sam Ovens:	Then Facebook allowed you to solve needs people didn't even know they had by making them aware of them. Tyler M.:	Yeah. Sam Ovens:	So, that's how they're currently doing it. Google AdWords, PPC, and then some direct mailers, postcards, things like that. Do they know their numbers? Do they know how much it costs them to generate a lead? Tyler M.:	Some of them do, like 50%. [00:28:30] Sam Ovens:	And what is that cost, typically? Tyler M.: [00:29:00]	The typical cost to generate a new heating and air conditioning, like a free estimate, which is what I help them get, on average it costs between 150 to $300. From your normal direct mail, radio, TV, Google PPC, maybe up to $400, and about 250 is the average. When I generate the leads on Facebook, I'm able to generate leads for about 75, yeah. About 75 bucks to 100 bucks consistently, and as many as they want, as many as ... I haven't even pushed the limits of what one market can produce on Facebook. Sam Ovens:	Got it, and then yeah. Because if it was profitable through those old methods, wouldn't the business just spend more money on those old methods? [00:29:30] Tyler M.:	Yeah. It's profitable for them, but they still think it's a lot of money in their mind. When they pay the radio guys $3,000 every month, and they maybe only see that a few sales came in, which still paid for it, or maybe even more than a few, a lot of them don't track where all their sales are coming from. So, they just keep paying or they don't know. They're kind of running in the dark. [00:30:00]	I had one client the other day, we went over all the leads I sent him and he thought no sales had come in, and then when he looked at the website and all the sales that had come in from the website, they were all from Facebook, and I just showed him the numbers. A lot of them don't know where they're coming from. They're just paying it, and they don't have the confidence to scale it up because they don't even know if the sales are coming from that source. Sam Ovens: [00:30:30]	Yeah. Yeah. It's hard. So, you're able to do it much more reliably, cheaper, predictably, and scale it up too. That's where you really come in and add the value? Tyler M.: [00:31:00]	Exactly. They like it predictable. I like that I can do it predictably for them, and yeah. We can scale it up whenever they want, and a lot of them, most of the clients I've worked with so far, we haven't even talked about scaling it up because just at the low scale we're at now, some of them we have to slow down the marketing because there's so many leads coming in, and they've got to hire new salespeople. Sometimes we've got to slow it down. Sam Ovens:	Got it. Tyler M.:	We haven't even come close to the amount of scale we can get on Facebook. Sam Ovens:	Then, how do you target these people on Facebook? Tyler M.: [00:31:30]	I just target homeowners in the ... Let's say that my client is in Florida. Let's say it's Tampa Bay. I'll target homeowners in Tampa Bay between the ages of 27 and 65, or 30 and 65, male and female, and that's it. It's very simple targeting. Sam Ovens:	You're wherever the client is, the HVAC business, you draw a perimeter around the serviceable area that they define, and then you're just looking for homeowners? Simple as that? [00:32:00] Tyler M.: [00:32:30]	Exactly. Exactly. Let's say wherever their office is in the city, we'll do a 20-mile radius around the office or a 30-mile radius, and we're just targeting the homeowners in that area, and that's it. It doesn't get any more detailed than that. I've talked to some clients that they're not my clients, but I had strategy session calls with their marketing people. They were telling me about how they run their Facebook ads, and they were going so detailed with the targeting and the results were awful, and yeah. There's no need at all to go detailed. Like you mentioned in your training, you want to go broad with Facebook. That's exactly what I do when it comes to targeting these homeowners. Sam Ovens:	Yeah. You go broad because then the algorithm narrows it for you. Yeah, but if you go narrow then it narrows what's already narrowed to nothing. Tyler M.:	Yeah. Sam Ovens: [00:33:00]	Then, what interesting trends did you observe selling HVAC, like the people that buy it, the most common people that buy it? What attributes do they have in common? Tyler M.: [00:33:30]	None really except they're homeowners. That is it. I would sell to the people who their complete home was a mess. They were on disability, but they bought a $10,000 heating and air conditioning system, the exact same that the little bit wealthier families would buy. As long as they're a homeowner, that was their main character trait that was the same, but then it was just different. Every home was different. Sam Ovens:	There's always something, though. I can kind of understand the disability one because they're probably at home a lot. Tyler M.: [00:34:00]	[inaudible 00:33:47] they have families, a lot of them. Maybe 80% have families. There's only 20% which is the husband and the wife, from what I saw on my calls. Sam Ovens:	Why do you think that is? Tyler M.: [00:34:30]	Since they have families, they've got to make sure their children are warm or cold. Someone, the furnace breaks down, or the air conditioner breaks down, or it's not working properly, they probably feel like they've got to take care of this for their kids as well. When it's just the two people, maybe they say, "Oh, we'll get by," or, "Maybe we'll just go vacation here or somewhere," or something, but I noticed, yeah. About 80%, they all had families or they were about to build a family. Sam Ovens:	Got it. Yeah, because that ... It would be interesting to see why a family makes someone more likely to buy HVAC. [00:35:00] Tyler M.:	Yeah. I'm trying to think of what other things could make them similar, but I can't. Sam Ovens:	Because some people don't have it. Tyler M.: [00:35:30]	Not where I am in Toronto. In Toronto, Canada, I'm pretty sure ... Well, obviously there's some people that don't have it, but the majority have it, but not an air conditioner. Not everyone has an air conditioner, but everyone has a furnace around here. I'm sure it's similar with New York. Everyone- Sam Ovens:	What's a furnace? Tyler M.:	A furnace is what heats the home. Sam Ovens:	Got it. Tyler M.:	It's also known as a boiler system. Sam Ovens:	Yeah. I guess what I'm talking about is air conditioning, yeah. Tyler M.:	Yeah. In Toronto and New York, not everyone has an air conditioner. Most do, but not everyone, but everyone has a heating system, or a furnace, or a boiler. [00:36:00] Sam Ovens:	Yeah. I can imagine in Florida, the people would probably have an air conditioner, and then probably in Las Vegas, and different parts like that, too. But what's fascinating is that in New Zealand, nobody has air conditioning. Tyler M.:	Really? Sam Ovens:	Yeah. No one. Tyler M.:	Wow. Sam Ovens:	I mean, the commercial buildings do, but no house does. Even the fancy $10 million ones, no air conditioning. [00:36:30] Tyler M.:	Wow. That's a huge, huge market for an HVAC company to sell air conditioning. Sam Ovens:	Yeah. I think a lot of it spreads by ... It starts populating once it gets popular, you know what I mean? Once some people start doing it, everyone starts doing it. It's like when I was in Canada, you guys have got an obsession about screening in porches. Tyler M.:	Screens in porches? [00:37:00] Sam Ovens:	You know that screen that stops bugs from coming in? Yeah. Tyler M.:	Yeah. Sam Ovens:	Dude, everyone has one, and they're always talking about the damn thing like, "Oh, that's a nice screen, eh?" I'm like, "What is wrong with these people? They can't-" Tyler M.:	At the front door? Sam Ovens:	If they ever have a porch or a back deck that's on the back of the house, right? Tyler M.:	Yeah. Sam Ovens:	They will always screen it in. Tyler M.:	Yeah. That is true. I've never- [00:37:30] Sam Ovens:	Yeah. It's something I've only observed from being outside and going in. Tyler M.:	Yeah. I've never noticed it, but yeah. It is true. Sam Ovens:	I was like, "Whoa. This is ..." It's one of those things that's caught on. It's like a virus, and then they would talk about it with each other. They would be like, "What do you think of this new screen?" And then- Tyler M.:	Where were you? [00:38:00] Sam Ovens:	I lived in, what was it called? It was in Quebec in this place called Hudson for like a month, or six weeks, or something at one point. Tyler M.:	Okay. Yeah. That's way up north, but yeah. I can see them having a lot of screens up there because even when you come down south more, there's lots of screens. It's just the thing. Sam Ovens:	Yeah. I thought if I had made a business here, man, I'd just be selling these damn screens because everyone likes them. Everyone talked about them. It was like an obsession point. [00:38:30] Tyler M.:	Yeah. That's funny. In New Zealand, it doesn't get really hot or really cold? Is that why, or it doesn't get really hot? Is that why they don't need the air conditioning? Sam Ovens:	It never gets very hot. The max it might get in summer would be like 29 degrees, and then in the winter, it's like five. Tyler M.:	Oh, that's it? Sam Ovens: [00:39:00]	Yeah. It's not very extreme, whereas I've observed in New York it's been 40 high, and then it's been -20 low. That's a variation. That's a spread of like 60 degrees, whereas in New Zealand the spread is only like 14 ... No, wait. It's, let's say 30 and five, so 25. Yeah. It's almost a 300% difference in fluctuation. Tyler M.: [00:39:30]	Yeah. It's crazy. It's the same temperature like New York here in Toronto. It gets super hot, and then super cold, and yeah. It fluctuates a lot. Sam Ovens: [00:40:00]	Now I understand this thing. I understand it, and then how did you package together ... Well actually, let's go back to the point where you've picked your niche, which is HVAC. You have decided you found their problem. You want to solve that problem for them. How did you know that you would be able to solve it for them? Tyler M.: [00:40:30]	I've been marketing. I've loved marketing for I don't know how long. I studied as much as I can on it about psychology, psychology and how the human mind works. That's even more fun for me to read about and learn about, so I knew I could get the results. It just was a matter of my being able to get a client, and then testing a whole bunch of different ads and seeing which ones worked. My first week with my first client, I wasn't getting much results. [00:41:00]	I was getting clicks to the website, but I wasn't generating leads. Just maybe one or two, but then once I switched it up a bit and I had a strategy session call, and a client had told me their strategy they were using on Facebook last year. I was like, "Hey. I'm going to test that strategy." The way it's structured, the forms and stuff, I started testing that strategy with the ads that I run, with the ad copy I run, and it just started taking off. Yeah. I had- Sam Ovens:	I guess I mean before you even got a client, right? How did you know you would be able to make it work for them? I guess you didn't, but you just believed- Tyler M.:	I didn't. Sam Ovens:	... in your ability to figure it out? Tyler M.:	Exactly. Sam Ovens:	Got it. Tyler M.:	I knew that I would figure it out. I just need to get a client. [00:41:30] Sam Ovens: [00:42:00]	That's probably the most important thing someone who is listening can learn from this so far is that once you get to that critical spot where you've found a niche, you've found their problem, and you think you can help them maybe. You're not 100% sure because the only way you can be sure is by doing it, and you can't do it without getting a client, you're in this spot. You have the only way to do it, and the only path forward is to believe in your ability to figure it out and just do it, which is what you did. Tyler M.:	Yeah, exactly. Sam Ovens:	Then, how did you package together the services that you're offering, and how did you price them, your offer to this niche? Tyler M.: [00:42:30]	My service that I offer them is Facebook ads, and I really just package it as Facebook ads, and that's what they get. They get Facebook ads, and I sell it for $2,000 a month. Sam Ovens:	But they don't want Facebook ads. They want clients. Tyler M.: [00:43:00]	Yeah. I guess I don't sell it as Facebook ads. The whole strategy call, I never talk about Facebook ads ever. It's just about them reaching their goal. I sell them that I'm the guy who is going to help them get to their goal, and it just so happens that the machine I'm using is Facebook ads. They're not buying the Facebook ads, because they could buy that from everyone. They're buying me, and I sell my service- Sam Ovens:	They don't want you either. Tyler M.:	They don't want me, but they need me. Sam Ovens:	They want the outcome. Tyler M.:	They want the outcome. Yeah. They're buying the outcome that we talk about in the strategy session call. Sam Ovens:	They're buying the outcome that you and Facebook deliver. Tyler M.:	Exactly. Sam Ovens:	Then, it's 2K a month. Now let's talk about how you get ... How did you get your first client? Tyler M.:	Facebook direct outreach. [00:43:30] Sam Ovens:	Tell me how that went. Tyler M.: [00:44:00]	I found the HVAC groups, the heating and air conditioning groups on Facebook where the owners were hanging out. I would add about 20 to 40 every day, just of the owners, and then every day I would try to send at least [inaudible 00:43:50]. Then once a day maybe every week I would generate about five to six leads. Some weeks a little bit less, but it was all from Facebook direct outreach. Then when I had about five clients, I started running Facebook ads, and now I'm focusing on ... I still do direct outreach, but I'm running my Facebook ads as well. [00:44:30] Sam Ovens:	Got it, and then you're running ads to a VSL value video, and then they apply for a strategy session, book into your calendar, survey, then you get on the call and you take them through the strategy session? Tyler M.: [00:45:00]	Yeah. Exactly how you lay it out, the funnel, that's how I do it. The only difference that I do is at the end of the strategy call, at the end of the strategy session, I don't sell the job for $2,000. I sell a seven-day free trial, and the reason I do that is because I know a lot of these owners have worked with digital marketing companies and they haven't got results. They're very wary about talking to me or paying another digital marketing company. What I tell them is it's a seven-day free trial. After the free trial, then it's $2,000 a month. Sam Ovens:	How do they do a free trial of something that costs money? Tyler M.:	It costs them money for the ads still. Sam Ovens:	Got it. Tyler M.: [00:45:30]	They're still spending the money on the ads, and I get them results, and then at the end of the seven days, it's $2,000 a month. But the way I structure it is I make them pay the first three months up front, and by doing the trial and proving that I can get results, it makes it a lot easier to get that chunk of money up front. Like I learned from Dan Kennedy, one of my other mentors, he teaches if you're selling a 12-month package, get the money up front. You're not going to be able to every time, but when you can, get what you can up front if you know you're offering value because you know you're helping them. [00:46:00] [00:46:30]	I set it up as a three-month agreement, and then it's month-to-month, but I get the three months up front, and then we go month-to-month. That's how I have it structured. I offer the trial, and then I sell the job, but I always try and get three months first instead of just one month. The trial, when I get them results, that solidifies like, "Okay. This guy knows what he's doing. I trust him, and I don't mind paying him whatever he asks me to pay him." So, that's why I structure it like that right now. Sam Ovens:	Got it, and then what is your goal and vision mission with this thing moving forward? One year from now, five years from now, where do you want to be? Tyler M.: [00:47:00]	By the end of this year, I want to have 20 clients paying me every month. I'll be around $50,000 Canadian money in profit a month, but then in the next three years I want to have it at $10 million per year. Right now, I'm focusing on raising my prices, but at the current prices, I would need about 230 to 250 clients, but I don't want to have that many. So I want to raise my prices, but then still get to that $10 million per year mark in the next three years. [00:47:30] Sam Ovens:	Got it. Awesome, and what would you say has been the one most transformative thing for you in the Consulting Accelerator program? Tyler M.:	The mindset, hands down. Sam Ovens:	Why? Tyler M.:	Because it reprograms your brain. Sam Ovens:	What was wrong with yours? Tyler M.: [00:48:00]	It was not programmed for abundance and prosperity, and I thought it was. For I don't know how long, I'd been reading personal development, everything about the brain, psychology, but when I watched your program and just the action steps on to read your goals in the morning, read them at night, program your mind with your headphones at night, write down what you want, write down the goals every morning and then review them at night. Just that little process. [00:48:30]	I always wrote my goal on my card, and I always looked at my goal all the time, but it never really got me there. It got me to some goals, but not exactly how I wanted it, but now that I have a mindset routine, it's changed everything. When I don't feel like doing it, I'll still do it. Some days I miss, but I know I'm on track. I would beat myself up before. Now, the next day, I just get back at it, but the mindset is what changed everything. Sam Ovens:	Got it. Awesome, and what would your number one piece of advice be for other members in the group? [00:49:00] Tyler M.:	My number one piece of advice is do the mindset work because it's the most important and then believe in yourself, and when you face those barriers and those obstacles that you're going to face no matter what, you have to just keep going through them. Just don't stop. Just keep focusing on your mindset and keep climbing. Don't stop climbing. Sam Ovens:	That's good advice. Cool, man. Well, thanks for jumping on, and sharing your story, and I'll let you get back to these HVAC businesses. [00:49:30] Tyler M.:	Awesome. Thanks, man. Sam Ovens:	Cool. See you later. Tyler M.:	See you.